Ricky Ross a.k.a. Freeway Rick is out of prison and he is now on a mission. to empower youth through the performing arts. After being sentenced to life in prison without the possibility for parole, Ricky Ross has been set free. The time that he spent in prison allowed him to transform from being illiterate to being literate. His determination to overcome his situation of imprisonment transformed into his freedom both physically and mentally. Ricky Ross has emerged from a life filled with danger and limitations into a life of hope and expectations not only for himself but for the youth. Ricky Ross granted Ed Magik TV an exclusive interview where he spoke about his triumph and how he felt about situations that occurred during his stay in prison. He also spoke about his feelings towards William Leonard Roberts II a.k.a. Rick Ross, the rapper. Also, in the late 2007, rapper Rick Ross, born William Leonard Roberts II, gave Ed Magik TV and True Magazine an interview at Def Jam Records. There is clearly a dispute about Roberts' use of Ricky Ross' name, former character, and image. Roberts, a former Corrections Officer, now wears his beard like Ricky Ross does. An on-line article published by SOHH.COM ( http://www.sohh.com/2010/05/freeway_rick_ross_on_rick_ross_lawsuit_i.html ) explains that Ricky Ross seeks to get his name back from William Leonard Roberts II who uses the name Rick Ross under Def Jam Recordings music label. Watch the videos below and take notice to the demeanor and attitude of both people, Ricky Ross (Freeway Ricky), and William Leonard Roberts (Rick Ross, the Rapper) . Also note the time line of events. You decide for yourself which person is being "True". The interview was hosted by Ed Magik, creator and producer of Ed Magik TV (http://www.edmagiktv.com). Location provided by Volim Couture, Inglewood, California, USA. 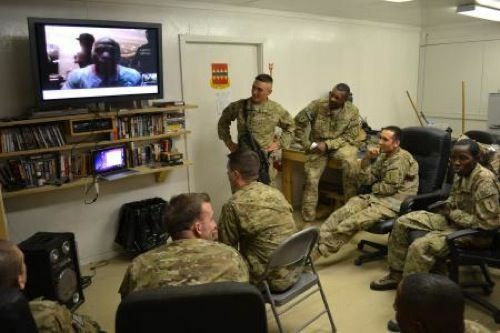 U.S. Army soldiers and boxing enthusiasts from 3rd Brigade Combat Team, 1st Infantry Division, Task Force Duke, talk with five-time World Boxing Council champion Floyd Mayweather Jr. via Skype at Forward Operating Base Salerno Sept. 2 (Photo by Maj. Travis Dettmer). While in the midst of busily training for his upcoming bout with Mexican powerhouse and WBC Welterweight title-holder Victor Ortiz (29-2-22KO), the undefeated six-time world champion of five weight classes, Floyd Mayweather Jr (41-0, 25KO), temporarily set aside his preparations holding a candid, yet lighthearted, Skype session on Friday with United States Soldiers serving in Afghanistan. Despite his training schedule, Mayweather Jr. found the time to hold nearly two-hour discussion in which he appeared relaxed, confident, and in good humor prior to his September 17 HBO PPV fight. “God bless you, thank you for fighting for this country... the red white and blue, there’s nothing better than this country, America - you guys are great, thank you so much… from the bottom of my heart.” Continuing, “You know, you guys are out there [fighting] in 120 degree weather so, if you guys can make [that] sacrifice, why can’t Floyd Mayweather make a sacrifice?” asked the Michigan born boxer to the Soldiers of mostly 1st Battalion 6th Field Artillery HHB “Hellions”(Task Force Centaur) and other Soldiers of Task Force Duke. When Floyd finally discussed his upcoming showdown for the WBC welterweight title, he dismissed the punching power and chances of Ortiz with a laugh and a flash of a smile. One Soldier asking Mayweather why so many of his fights have gone the distance at this stage of his career? Floyd responded by laying blame on the foe not wanting to engage him in a fisticuff scrap. “It’s like y'all, one shot can end it all." Despite a 16-month layoff, Floyd’s trip back into the ring promises to be an event, victory, or both. His prowess is second to none. His defense is “impregnable,” but more importantly, like many others hypothesize, it seems like a tune up for bigger things. “I’m working on the biggest contract ever!” he exclaimed. “Y'all know who it is.” To the delight of the packed room, Floyd began simulating the act of tying a tourniquet around his arm and pretending as though he was injecting a syringe into his veins. As the soon to be seven-time world champion ended his time with the troops, he did offer his political views on the conflict in Afghanistan. Note: The Salerno Skype Session between the Soldiers and Floyd Mayweather Jr. would not have been possible without the sincere dedication, hard work, and cooperation of Kelly Swanson and Leonard Ellerbe. And a special thanks to Floyd for taking the time to answer questions from some of those who are currently serving in Afghanistan. John Martinez is respected boxing writer who has interviewed many of the sport's top fighters. A regular writer for the Boxscore World Sportswire, he is an Afghan War veteran who is currently on active duty assigned to the U.S. Army Task Force Centaur PAO, S7 & S9, 3rd Brigade 1 ID, 1-6HHB.